1. Set up for work: Make fixative, put on old shirt, find forceps, and so forth. Half-fill two wells of one depression slide with saline; half fill the middle well of the other depression slide with fixative (see Note 10). Put both slides onto the black plastic plate (or your local equivalent), long sides adjacent with the saline slide further away; transfer 6-10 larvae from their vial into one of the wells of saline. Age and condition of the larvae are very important. The older the larva the more highly polytene its salivary chromosomes and, therefore, the easier to see banding patterns; however, larvae that are beginning to pupate are also beginning to degrade their salivary chromosomes—these are not useful for routine analysis. Take larvae that have crawled up out of the food onto the glass wall but which are still actively moving; larvae that have slowed down, and especially those that have everted their spiracles, are too old (see Note 11 about gluelessness). The larvae should still be quite active once they are in the saline. Discard at this point any that are not. Cultures do not always go so well that larvae crawl up out of the food to pupate, however. When this happens, you must dig those mature larvae out of the food (use the dissecting microscope to see them) (see Note 12). 2. Using the dissecting microscope at medium magnification, move one larva from the holding saline well into the other ("dissecting") saline well. With your nondominant hand and the poorer pair of forceps, grasp the larva about halfway along its length; with your dominant hand and the better pair of forceps, catch the "nose" of the larva just behind the end of the black mouthparts (see Note 13). Once you have both grabs solid, pull the forceps apart, gently but firmly. The larva will come apart too, and if you have placed your forceps correctly and pulled steadily enough, the larva's breakpoint will be next to the nose forceps; the mouthparts, with associated larval structures including the salivary glands, will pull free of the rest of its carcass (see Note 14). While you still have the body in your body forceps, discard it. 3. The salivary glands are the long paired translucent structures; they usually have white, opaque, mostly flat fat bodies attached to them. Seeing all of this requires a black background, hence the black plate or equivalent. The very best dissection is one in which the fat strips itself off the glands as they emerge from the larval body; unfortunately, this is more luck than skill. Fortunately, it is not necessary to get every scrap of fat off the glands for aberration analysis. However, do remove not only mouthparts and so forth from the glands but also at least the large flat bits of fat—and as much of the side strips as come off easily. Do not waste much time on this, however. 4. Grasp the glands by their common anterior duct, if they are still joined; otherwise, do pick both up together but try to minimize the amount of saline being carried over. Do not squeeze them. Lift the glands from the saline; move the plate so that the fixative well is visible through the microscope and immediately transfer the glands into the fixative. Prod them under the surface with the transferring forceps; make sure any accompanying saline is diluted away from the glands. Those forceps are now contaminated with fixative; we will clean them later. 5. Pick up a cover slip, breathe on it gently, and carefully rub it with your shirt tail to clean it. Hold it so that the room light reflects off the surface so you can see, and rub off, any bits of lint. Put the cover slip on some convenient piece of clean paper (e.g., an index card) and deposit onto its center 8 microliters of stain in one drop (see Note 15). All of this should take 10-15 s and the glands should have been in the fixative long enough; look at them. Gone from translucent to white? Fine (see Note 11). Move the glands up the side of the well to the surface of the fixative with the contaminated forceps; from there, it is relatively easy to lift them out of the liquid using surface tension to hold them to one tine of the forceps to minimize transfer of fixative into the stain. If both glands do not come at once, transfer the first to the stain and come back for the second (see Note 16). Do not leave the glands in the fixative longer than necessary. If the stain runs away from the glands then you have transferred fixative across too; use the forceps tip to move the stain back over the glands and try not to bring so much over the next time. 6. Clean the forceps by wiping them well with rough paper toweling (see Note 17); alternatively, run them through a piece of filter paper (see Note 18). If, during subsequent dissections, the glands or other internal larval parts start to turn opaque while they are still in the saline you have brought back fixative on the forceps; stop, discard saline and larvae, wash that depression slide and your forceps thoroughly, add fresh saline, and begin again. 7. Go back to the saline wells, move another larva over into the dissecting well, and proceed from step 2 to dissect, and begin staining, a second set of glands while the first one is staining. How long the glands should sit in the stain before squashing depends on the particular batch of stain, temperature, and so forth, but it is usually around 5 min; I get another five larvae dissected and into stain by the time the first one is ready for squashing—your early mileage may differ. It is better to understain than to overstain, so if you have only done three by the time the first has been 5 min in stain stop there and start the squashing steps on it— then on each of the others in turn. 8. Clean a slide with breath and shirt tail just as you did for the cover slip; holding the frosted end, set the other end against the index card near the first cover slip so that the body of the slide is above it and gently lower the frosted end until the slide just touches the top of the drop of stain—at that point, the whole cover slip will rise to flatten against the slide. Turn the slide cover-slip upward, put it onto the white tapping-out plate, and put both under the dissecting microscope under high magnification. Focus on the glands, which should be visibly flattened pinkish cells at this point. The stain should extend more or less evenly to the edges of the cover slip and be featureless. If there are dark lumps in it you have shaken your container of stain; throw these preparations away, recentrifuge your stain, and begin again. If there are darker but nonlumpy regions of stain, check them for included bits of lint. As long as it is not actually among the cells, a small piece of included lint does not preclude a good squash but a large one anywhere does. By all means, prove this for yourself but also try harder to be truly clean for the next preparation (see Note 19). 9. Just touch the edge of the cover slip with the first two fingers of your nondominant hand: This keeps the cover slip from slipping during the tapping-out. This does usually mean that you get stain onto those finger tips. Because the stain is strongly acidic, this can result in acid burns if it is not washed off, so always wash your hands and those fingers thoroughly when you have finished work (see Note 20). 10. Take your tapping tool in your other hand. The first series of taps is to break the cell membranes by hydrostatic pressure from the stain; these first taps therefore should hit the cover slip just outside the gland. Hit down, hit-and-bounce-back, hit firmly but not too hard (see Note 21); and watch what is happening to the glands. You should see the cell outlines disappear. Tap in different places for each tap. Usually around five taps is enough—you should be able to see the nuclei (densely stained dots) floating free but still all within the area the gland began over. If they are already scattered you have tapped too hard or too close or have large lint; if the cells will not break open you have fixed too long or gotten fixative into the saline. 11. The next series of taps are to break the nuclear envelopes—but not yet to spread out the chromosomes. Tap directly over the glands, harder than before, five or six times on different places. Stop and look. Most of the nuclei should now be invisible; tap more if many are not. The total time for both types of taps should not be more than about 5 s (see Note 22). 12. Take the squashing paper towel, folded edges up; fold over the top 30 mm or so and place the slide inside this fold, slide-edge snug against the inside of the top fold (see Note 23), with the cover slip up and within the area of the side fold (see Note 24). With the slide near the edge of your bench, put the ball of your thumb directly over where the cover slip is and press down firmly; then roll your thumb to the left and to the right. These actions are both pressing and wicking the stain out from under the cover slip (onto the towel); this flow will spread out the chromosome arms. Whether just one thumb's pressure is enough depends on your size and thumb strength; I myself rest the heel of the other hand directly atop the squashing thumbnail and press down with that hand—forearm strength only, no need for whole-body weight. It is important for the squash to be quick and firm; it is the initial outrush of stain that gives a good spread. No amount of remedial squashing will transform a poor squash into a good one. However, really firm pressure is not needed. If your thumb gets sore, you are pressing too hard (see Note 25). 13. All of the tapping and squashing should have taken as much or slightly less time than it took to dissect the gland in the first place, so the next staining gland is ready for tapping and squashing: Do that, then the next, and so forth. Once you have the whole set squashed, examine them with the compound microscope; you may have your perfect preparation in this set—and if you do not, you need the immediate feedback of what did not work while you can remember what the "did not work" was. 14. Before you begin your next round of dissections, discard and replace the solutions in the wells. 1. Assemble your preparations, salivary-band maps, compound microscope, lots of paper and a sharp pencil. Put the first slide under the compound microscope cover slip up; check Köhler illumination and set the condensor for phase for your low-magnification objective lens—usually phase 2. Find the glands and scan across them for quality of spreading. Look for regions where well-spread nuclei are common. Usable preparations typically fall into one of two categories: Either the nuclei at the edge are overstretched but the ones in the middle are fine; or the nuclei around the edges are fine but the ones in the middle are underspread. Any nucleus in which you can identify the region of interest is usable, but first you want to find your aberration, and to do that you need to be able to identify all of the chromosomes in one to several cells, even if you already think you know what kind of aberration you have and where it is! You may be wrong. Thus, the first step is to find regions with nuclei that look somewhat like starfish under low power. If there are none, toss that slide and look at the next one. Once you have switched to oil it is inconvenient to have to go back to low power (see Note 26), because the oil on the slide changes the point of focus for the 16x lens—much better to do your scanning at 16x first, jotting down likely-looking regions by stage coordinates. 2. Now switch over to 40x dry (or 63x oil). Are the chromosomes flat as opposed to curling around themselves? If not flat, do not waste more time on that preparation, go to another, hopefully better, one. Is the banding pattern clear and crisp? If the thicker bands are dark black smudges, you have overstained and will not be able to make the finest discriminations. All published photographs of salivary banding give the appearance of overstaining as a side effect of the photography; you want your preparations to look much less stained than that. 3. Look at the nuclei; identify ALL of the chromosome arms and scan them for abnormalities. At the beginning, you will find it helpful to make a line sketch of all of the chromosomes with the positions of the landmarks indicated—this helps you to keep straight what regions you have identified and cleared as normal versus regions identified but suspect versus regions not identified yet. Jot down the stage coordinates of every nucleus from which you get information; as the analysis proceeds you will be refining your ideas of what is going on, and when you change your mind (as you will several times during any analysis) it is very helpful to be able to go back to see how you were mistaken earlier! If you were. It may well be the second determination that is wrong. Do not forget to check the heterochromatin and chromosome 4. Learning how to distinguish between the basic arm landmarks (each arm has landmarks at its tip, middle, and base, and they all have distinctive names that help to keep them straight; a sample of the named landmarks are indicated on Fig. 1) is the one part of learning the chromosomes when it is really helpful to have a coach to check that you have identified all of them correctly. If you have to learn all by yourself, be especially careful not to accept an arm identity by only one landmark until you are really very sure what it looks like under a variety of circumstances—instead, always check for at least one other landmark for that arm, preferably two, and eliminate the other arms by two or more landmarks as well. 1. Find all five tips, bases, middles in the first well-spread nucleus. If you already know which region to be looking in, locate it and see what you can tell about it, but do not try to get too detailed yet. Is it making a buckle (loop)? Then it may be a deficiency (or a duplication or a small inversion)—but completely normal regions can make buckles (just look around the rest of the genome); you need to see a buckle in at least most cells before you can conclude "deficiency" (or whatever). Is it making a joint with another chromosome? Then it may be a translocation—again, you need to see joints (or asynapsis) in all cells before you conclude "translocation." Is it making a joint with its own or other arm? Then, suspect inversion (large). If you do not know which region to be looking in, look around and make mental or physical note of anything that looks suspicious, then go immediately to another nucleus and check it out as though it were the first— compare, anything in common? then go to a third, and so on. If you have really found your aberration then you should be able to identify it in each and every nucleus (see Note 27). The only exceptions to this rule are very small deficiencies and inversions, which will sometimes lie sideways to your plane of view and be detectable; at other times the normal homolog will lie uppermost and the chromosome will look completely normal. Here, you must find chromosomes with that region asynapsed before you will be confident that you know your aberration! 2. Still at intermediate power, once you think you know what type of aberration you have, check around the rest of the genome to make sure that there is nothing else major heterozygous! You will never be able to eliminate the possibility of extraneous small deficiencies or solely heterochromatic translocations, but you can eliminate most other aberrations (see Note 28). 3. If you have a translocation or a large inversion, work out to the letter division where all the breakpoints are. This is done as follows. Figure out which arm by the major tip-mid-base landmarks. If you are lucky, your break will be near a landmark; if not—you will have to work your way in to it, using the low-magnification maps, matching up what you see with the maps. Worry about only the darkest bands here, generally the ones that start letter divisions. Work your way in from both directions (sequentially). You should get to the same place! If you do not, try again on another nucleus. Keep at this until you are reasonably confident that you can see the correlation between the maps and your chromosomes so that when you go to high power and the detailed maps you will be looking in the right region! Do not worry too much about what the junction of the synapsed aberration looks like at this point, but do keep track of any nuclei in which that junction looks particularly informative; you will come back to those later. It is a good idea to be making drawings of the bandings at this stage, although it gets a bit tedious if you are dealing with a breakpoint very distant from landmarks in both directions; it is very much easier to draw the chromosomes and the dark bands (just the darkest bands at this stage, with as much morphology as you can see in them), and label the drawing with what bands you think they are, than to try to keep track in your head. Some regions are particularly prone to long stretches of similar-looking banding patterns; if you really get stuck trying to fit the banding patterns on your chromosomes to the Bridges maps, Lefevre's photographs (1) may help (or the excellent ones that were available in the Encyclopedia of Drosophila), but use them only to sort out which Bridges bands are which and switch back to his drawings immediately; you will learn your way around the chromosomes much faster. You will also begin to recognize additional banding patterns that are sufficiently distinctive to be within-arm landmarks that are closer to your region of interest than the "formal" landmarks are. 4. Once you are confident that you know pretty much where all your breakpoints are, switch over to 63x or 100x and oil—and the high-magnification drawings. Now you are ready to try to figure out exactly where the breakpoints are (see Note 29). Aberrations whose breakpoints are far apart frequently synapse up completely, so all you have to do is find nuclei where the breakpoint is lying completely flat, as a cross; draw the bands (now all the bands that you can see, not only at the breakpoint but also far enough back on all four arms so that you are sure that you are in the right place); and identify them from the high-magnification maps. You will never find all of the bands that Bridges drew in (or not without going to lengths described in Subheading 3.4., step 2), but try to see, and identify, as many as you can, not only at the breakpoint but also nearby—the nearby ones will give you a feel for what you can hope to resolve at the breakpoint in that preparation (see Note 30). The assumption is as follows: If bands on the homologs are synapsed, they are the same band. Get your first drawing labeled up as detailed as you can, then go find another clear nucleus and start from scratch, complete with drawing it too. Then go find a third. If all three agree and you are satisfied with the level of detail, stop. However, if they differ very much at all, keep on finding more informative nuclei and also go back to the ones you have done to see if you can figure out why they differ—in the end all your drawings must either agree or else have an explanation of why they do not agree (e.g., 69B twisted and hard to see in this nucleus). Keep in mind that you will very likely never be sure exactly where a breakpoint is from orcein cytology, just keep trying to refine it. 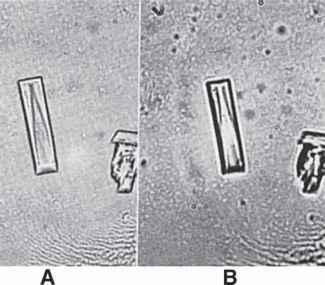 For example, 69C is a letter division of faint bands; in most nuclei you will probably only be able to see 69C1,2 and 69D1-3, but if you look around long enough you will find one with C4,5 visible, and if you are lucky they will be synapsed so you will know which side of them the break is, and if you are very lucky you will see C8,9 too—your final description of the breakpoints should reflect exactly how much information you have been able to gather and not one whit more. For example, if you are sure that 69C1,2 is on one side of the breakpoint and 69D1-3 is on the other side, then that breakpoint is given as 69C3-11 (see Note 31). 5. The conventions I use for describing breakpoints (I have never seen the conventions written down) are "range I cannot see on the left"; "range I cannot see on the right" [e.g., for an In(2LR) 30B11-12; 60F3-4 (interband) means that I saw 30B9,10 distal to the break and 30C1,2 proximal to it but did not see 30B11 or 12, whereas on 2R I saw 60F3 proximal and 60F4 distal; "(interband)" means that the breakpoint appears to be in an interband—as always, the possibility that the break is actually a little bit into a band that looks unaffected cannot be excluded]; for a deficiency, 70D2; 70D4 means that I have seen that 70D1 and 70D5 are still present and D2-4 are absent. 6. If you are having trouble getting a good fit for all four arms around the breakpoint, the most likely problem is that you are in the wrong place entirely; go back a stage and recheck where your breaks are at the gross level. However, although the banding patterns are really quite remarkably constant there are differences between larvae, and for some regions, the maps seem to have been drawn from unusually old or young ones: For those regions, the patterns of dark versus lighter bands in my preparations very rarely match the high-magnification maps. I have found Sorsa's drawings of electron microscope (EM) banding patterns (10,11) to be very helpful in such cases (see Note 32). 7. Fully-synapsed aberrations are frequently rather bunched up, bandwise, and relatively little detail can be seen. Partly asynapsed chromosomes can be helpful here; you can frequently see many more of the faint bands in the asynapsed parts, which you can then find synapsed in other nuclei so you know which they are as well as that they exist. Sometimes the banding patterns of the two parent chromosomes are sufficiently different so that a tentative identity of bands up to the breakpoint can be made from the asynapsed junction chromosome, but this should be backed up by finding synapsis—and also by getting the same breakpoint from the reciprocal junction chromosomes! This latter is very important, both as a check of the accuracy of the first determination and also as a check that your translocation or inversion does not have a small deficiency at one end—or a small additional inversion. Nuclei that are fully synapsed on one side but asynapsed on the other are most useful here; keep looking for them and refining your information (see Note 33).